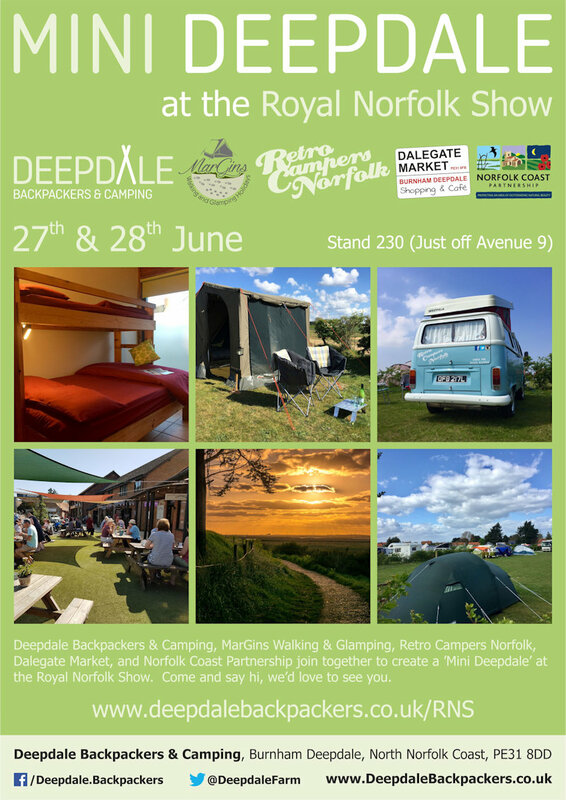 Deepdale Backpackers & Camping, MarGins Walking & Glamping, Retro Campers Norfolk, Dalegate Market, and Norfolk Coast Partnership join together to create a ’Mini Deepdale’ at the Royal Norfolk Show. Call in and say at our Mini Deepdale stand, number 230 just off the North end of Avenue 9. We’d love to have a chat and introduce you to our friends, and find out lots more about visiting the beautiful North Norfolk Coast. We’ll be running a competition. All you need to do is fill out the form at the show or online to join the mailing lists of the participating companies and you could win some amazing prizes. Here’s a little taster of the organisations taking part in the Mini Deepdale stand at the Royal Norfolk Show. Live music, drinks and celebrate 50 years of the Norfolk Coast Partnership and the AONB. Live music and a chat. Offering great camping and backpackers accommodation in Burnham Deepdale on the beautiful North Norfolk Coast. The perfect base for exploring the walks, wildlife, big skies and stunning landscape. Book a pitch for a tent, campervan, motorhome or trailer tent on the campsite, with options of electric hookups and fully serviced. Alternatively if you prefer a kitchen, sitting room and ensuite bathroom, then why not book a private room, family room or dorm bed in the backpackers hostel. There’s even a groups hostel for those larger groups of family and friends. Reception is Deepdale Visitor Information Centre, a well stock tourist information centre, offering a wide range of information about this wonderful area of Britain. Deepdale is home to the Deepdale Festival in September, a music and arts festival, and to Deepdale Hygge in March, a festival celebrating the beautiful North Norfolk Coast. Immerse yourself in walking the beautiful Norfolk Coast Path National Trail (AONB) whilst MarGins set up your glamping tent and transport your luggage along the way. Their tents are fully equipped with everything you need with that all important touch of luxury plus a breakfast hamper of homemade and Norfolk produce will be replenished each day. MarGins have 3 suggested walking holiday options, can supply glamping at Deepdale, or happy to tailor a holiday just for you. Oh and they’re very dog friendly, even supplying everything they will need to ... they look forward to welcoming you to the breath-taking Norfolk Coast. Established in 2011, based in Sheringham, North Norfolk. Their beautiful campers come fully equipped with everything you need as well as insurance and breakdown cover, so your adventure starts as soon as you collect your camper. The main ethos of Retro Campers Norfolk is freedom, which includes unlimited mileage within Norfolk and Suffolk. Come explore Norfolk and Suffolk with Maggie May, Mr Blue Sky, Tutti Frutti, Brown Sugar, Penny Lane or Barbara Ann. (All of them are regular visitors to Deepdale) Where would you like to go? Next door to Deepdale, Dalegate Market is home to independent shops, Deepdale Cafe, a supermarket and fuel station. 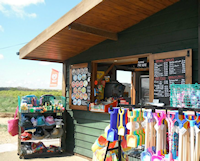 This small shopping site in Burnham Deepdale has become a major hub on the beautiful North Norfolk Coast. Pop up shops are hosted throughout the year, changing weekly on a Wednesday, and Dalegate is home to one of the premier Christmas events in the East of England, the Deepdale Christmas Market. You’ll find clothes, accessories, jewellery, wildlife watching equipment, art, crafts and great food and drink. Pop in for one of the best breakfasts on the North Norfolk Coast, a coffee, lunch, a browse in the shops, and find that perfect gift or item for home. Responsible for conserving and enhancing the natural beauty of the Norfolk Coast Area of Outstanding Natural Beauty (AONB). The 453 sq km area includes a coastal strip from Heacham to Bacton, plus outliers around the Sandringham area and between Sea Palling and Winterton. There are 46 AONBs in the UK, along with National Parks, these are recognised as being worthy of special protection. The Norfolk Coast Partnership was set up in 1991 to work in partnership with local communities and all relevant organisations to safeguard the special character of the area. It is funded by Defra, Norfolk County Council, North Norfolk District Council, the Borough Council of King’s Lynn and West Norfolk, and Great Yarmouth Borough Council. The Mini Deepdale stand is part of the wider Tourism Village, which will be hosting lots of tourist attractions, so well worth a visit during your day at the Royal Norfolk Show. Price: You’ll need to pay for entrance to the Royal Norfolk Show (FREE after 3pm on Wednesday), but visiting the Mini Deepdale is absolutely FREE. ’Mini Deepdale’ at the Royal Norfolk Show - Deepdale Backpackers & Camping, MarGins Walking & Glamping, Retro Campers Norfolk, Dalegate Market, and Norfolk Coast Partnership join together to create a ’Mini Deepdale’ at the Royal Norfolk Show.